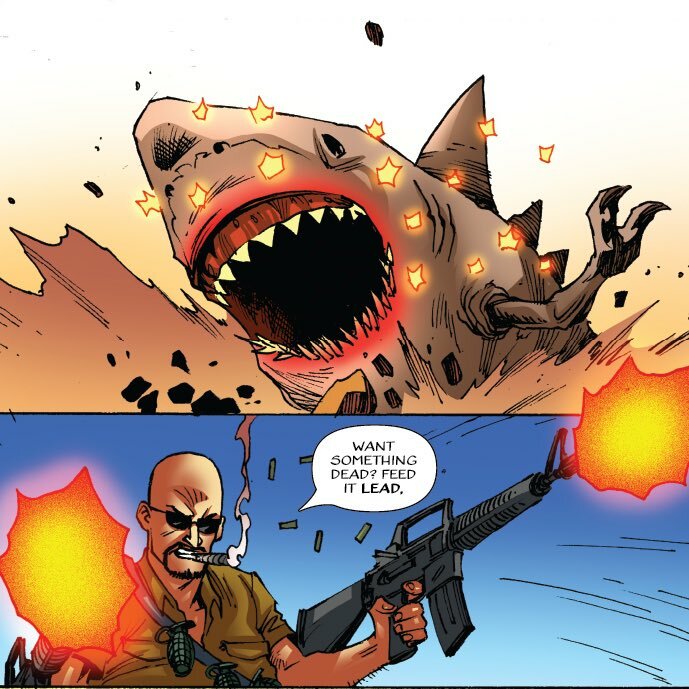 Based on the 2014 short film of the same name, Sharkasaurus is also a graphic novel. This fun thrilled romp has all the hallmarks of an enjoyable B-film of the 50’s. Those monsters back then did not have the help of today’s CGI technology to realize in glorious 3D or realistic proportions. Usually, they were puppets carefully brought to life through stop-motion or marionettes. Flash forward to the print medium, none of that will matter. Those who saw the video will find a huge difference and none of that truly matters when in the desert, nobody can hear your distant scream and mistake that for a screeching hawk. The book expands on the material from the book and greatly expands on why such a land shark exists. Also, Alice Monroe is set up as the would-be heroine. I do not want to give away the entire story. Here, she and her mate Frankie are in an archaeological excavation to unearth clues to another Proterozoic species said to roam the earth. Along the way, Creationists led by Reverend Peter Matthews and his daughter (she’s not immediately named) object to the rewriting of more than just “the scripture.” He’s your stereotypical evangelist, and quite laughable to say the least. Will he get his just desert in the dessert? The video answers that very easily, and what this dinosaur symbolizes is nothing like Devil Dinosaur (Marvel Comics). Godzilla? Maybe. Had this version been a Hollywood budget film, I would be on it faster than another SyFy Monster Movie of the Week. This network does not always executive produce bad films; after a while, the same old concept can get tiring. Unless the product offers a unique spin, I am not always interested. Timing is also important too, as this year’s broadcast of Discovery Channel’s Shark Week celebrates its 30th anniversary! When writer/creator Spencer Estabrooks past works include Deadwalkers and Legend of a Lich Lord (link goes the video), to see the passion put behind the work is particularly noticeable. I find his approach to storytelling and the type of dialogue he crafts honour the tropes from those genre movies he adored watching as a youth. With Lich, it is very Dungeons and Dragons with the right dose of Ferris Bueller style meta mixed in. For this film turned book, I get the feeling he saw the entire Tremors series far too many times. To have a female heroine is nothing new, but to show that she can stand her ground against all the male idiots she has to deal with (and also for the other female characters in this tale) is a nice touch. The art by Jethro Morales is familiar. He’s done work for Dynamite Entertainment and is best known for his work in various Army of Darkness titles. The way he emotes the action sequences is nuclear! The gore is tame as I was wanting to see very visceral kills. The colouring job by Adriano Augusto certainly highlight the style for a vintage film, and that alone gives me high hopes for what the next volume can bring. I can only imagine the hunt will get grislier. After reading this work, I am ready to support crowdfunding part two!